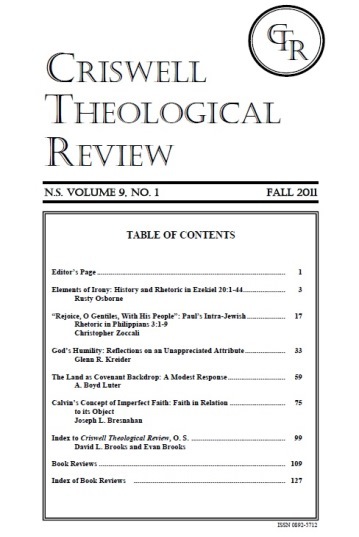 The Fall 2011 edition of Criswell Theological Review offers our subscribers several articles dealing with biblical and theological studies. Rusty Osborne, editor and moderator of lawprophetssandwritings.com, examines Ezekiel’s use of irony in Ezekiel 20:1-44 as a means of maximizing prophetic rhetoric. This is an important article for those teaching through the Book of Ezekiel. In his article, “‘Rejoice, O Gentiles, With His People’: Paul’s Intra-Jewish Rhetoric in Philippians 3:1-9,” Chris Zoccali challenges the traditional scholarly view that this text represents an anti-Jewish polemic and offers an alternative view that it is actually concerned with Gentile Christ-followers retaining their own ethnic identity. Glenn Kreider, Professor of Theological Studies at Dallas Theological Seminary, contributes “God’s Humility: Reflections on an Unappreciated Attribute of the father, Son, and Holy Spirit.” In this provocative article Kreider explores the implication of Christ’s incarnation, especially as it relates to his human obedience and submission to his heavenly Father through the power of the Spirit. In “The Land as Covenant Backdrop: A Modest Response to Burge and Waltke,” Boyd Luter gently answers those critics who believe jesus spiritually fulfilled and thus replaced the literal land promises made to Israel. Taking up Waltke’s challenge to find one NT passage that pictures the resettlement of national Israel in the land, Luter offers Revelation 11:1-13 as such an example. His exegesis of this passage places the eschaton within the context of a literal return to the land of promise. Joseph Bresnahan, Assistant Professor of Theology at Criswell College, writes in “Calvin’s Concept of Imperfect Faith: Faith in Relation to its Object” that despite human weakness and depravity, faith triumphs because it rests on the promises of God and in the righteousness of Christ. Imperfect faith does not justify. It is God—the perfect object who justifies—in whom the imperfect faith rests. For those wishing to have a complete list of the articles and interviews that have made their way into CTR over the years, David L. Brooks and his son Evan Brooks have compiled an “Index to Criswell Theological Review, O.S.,” covering the years 1986-1994. The index for the new series appeared in the Spring 2011 issue of CTR. We hope the book reviews that round out this edition of CTR will enable you to stay on top of the latest in biblical scholarship and help you discern which books you might want to purchase for your library. To all our contributors, a special “thank you!” Your labor of love made this edition of CTR a reality.